The XShuai HXS C3 by Haier is a robot vacuum with original looks. The unit works really well on carpets. The brushroll system ensures a fair pick-up. The robot can be controlled via internet. One can use its camera to wonder around their home, similarly to the Jisiwei S+. Overall, I find this robot vacuum to be above the average. A robot vacuum that allows you to “video chat”? The Haier XShuai HXS C3 by Haier does that and much more. Equipped with a camera and with an Ethernet board, this new cleaner not only cleans, but can also connect to Alexa, thus paving the road towards a smarter home. More over, the Haier app is available on both Google Play and IOS marketplace, and it’s in English. You probably heard about Haier by now if you’ve read my previous analysis of their SWR Pathfinder. The XShuai C3 is one of their latest creations. Packing a long list of features, the new XShuai outpunches robots in and above its price bracket. Besides including a large brushroll and 2 side brushes, the product follows the trend promoted by almost all the Chinese manufacturers and offers also the mopping option. There are many other things which need to be said besides these highlights so, let’s get started. Here’s everything you need to know about the new XShuai. Powered by a 28 watt motor, the Haier XShuai HXS C3 is advertised to deliver a suction power of 1000 Pa. The 1000 Pa suction figure seems to be pretty standard, at least on the cover of the product box. After some intensive testing, as you see in my video review, I’ve found that it works well on carpets, but not so well on bare floors. It fails to match e.g. the 1800 Pa suction strength of the Xiaomi Mi Robot Vacuum or the 1600 Pa suction figure of the Roomba 980. However, considering that HXS C3 is considerably cheaper, the drop in suction strength can be an acceptable compromise. The suction power of the bot should face no trouble picking up fine dust particles and larger debris. Some might think the Haier XShuai HXS C3 is somehow under-powered. I would place it above an iLife V1, but bellow the suction strength of the iLife V7S Pro. When it comes to battery life Haier XShuai C3 doesn’t feel like a budget cleaning bot. It’s fitted with a 2600 mAh (14.8 V) pack that delivers a maximum run-time of 120 minutes. The cheaper XShuai T370 comes with the same battery specification and we would have liked it if Haier bumped up the capacity with the XShuai C3. The runtime of 120 minutes almost the best in class. In fact, with the self-charging feature, the limited runtime should hardly be a bother to people living in small to medium sized apartments. However, the battery does take 4 to 5 hours to charge fully, which means the bot would only manage to perform 2 to 3 cleaning sessions per day. The Haier XShuai C3 comes with a 300 ml dust tank, which can easily be accessed by flipping open the top panel. Haier XShuai definitely scores a point as most mid-range robot vacuum cleaners struggle with limited dust tank size. As far as dust cup sizes go, the XShuai C3 packs in a decent tank that manages to outshine more expensive models. Saving you the peril of emptying the tank frequently, the larger dust cup capacity makes the new XShuai perfectly suited for large homes or houses with multiple pets. On the other hand, the passive water tank can accommodate just a few ml of liquid. If you or your loved ones suffer from dust allergies, then the Haier XShaui HXS C3 should be a good choice. It’s fitted with a HEPA filter that manages to trap allergens such as dust and pollen. That being said, I must say I was expecting the filter to be bigger. Nevertheless, as stipulated in the standard, the HEPA material traps particles as small as 0.3 microns with 99.9% efficiency. Another caveat to this otherwise amazing dust filtration technology is that the filter is not washable. You would need to use the cleaning brush provided in the box to dislodge and remove the accumulated dust. Alternatively, you can even tap the filter over a dustbin to remove most of the dust. The marketing guys at Haier thought about the XShuai’s ultra-low profile. However, I think it’s nothing brag-worthy. The new XShuai sits 3.54 inches off the ground, which is a pretty standard height for a robot vacuum. For example, the Shark Ion Robot has a height of only 2.6 inches, which is a significant 0.94 inches shorter than the C3 bot. Standing 3.14 inches tall, even the Deebot D45 beats the XShuai C3 at this game. On the other hand, the new Xiaomi stands taller, at 3.8 inches. This pretty much proves that the 3.54-inch height of the Haier XShuai C3 is ordinary at best. As for the other measurements, the C3 has 13.39 inches at its widest point and weighs 7.25 lbs. Overall, XShuai C3 has a pretty standard frame and it should face no trouble navigating around tricky corners. The accessory kit that comes with the Haier XShuai C3 includes all the basics. You get a remote controller that allows you to change the cleaning modes and settings. Using the controller, you can even control the bot manually by pressing the directional arrow buttons. Unfortunately, you don’t get batteries with the remote. Moving on, the package also contains a standard charge base along with a power adapter. The XShuai also comes with a detachable water tank with mopping pad. Lastly, you get a small cleaning tool and some double-sided tape to fix the charging dock. Steams video – From monitoring your home when you are at the office to chatting with family members in other rooms, the inbuilt camera and speaker system is an ingenious addition. The Haier XShuai app lets you see what’s in front of the bot and even take snapshots and change the camera angle. This transforms the Haier XShuai C3 from an ordinary cleaning bot to a mobile communication and video monitoring device. It’s compatible with Amazon Alexa and SIRI – Saying “Alexa, turn on vacuum” is all it takes to start a cleaning session if you have an Amazon Echo device. You can even control the XShuai C3 through Apple’s SIRI. Has dual cleaning – The combination of mopping and sweeping delivers a decent cleaning performance on bare floors. The wet mopping is ideally suited for hardwood and tiled surfaces. The mopping pad can also be detached before cleaning carpets. 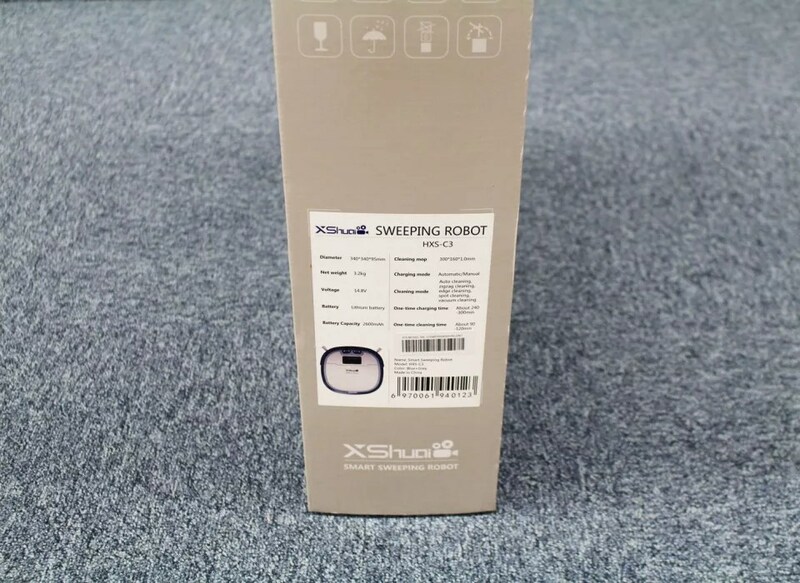 The XShuai HXS C3 lacks the 360 degree laser scanner and the floor mapping technology of the Neato BotVac Connected and Xiaomi Robot Vacuum 2. It instead follows an advanced zig-zag pattern algorithm, which allows it to cover the entire cleaning space without sweeping the same area multiple times. The bot is also equipped with anti-fall sensors, which prevents it from falling down stairs and other steep places. Adding to that, the Haier XShuai C3 also has proximity sensors and a bumper to prevent accidental collisions. One thing I’ve appreciated is the relatively low noise that it produces. It makes around 64 db, which may be important for some sensitive shoppers out there. Comes with a standard 1-year warranty. It’s a little more expensive then your average Chinese robot vacuum, but occasionally, you can get it with a considerable discount. What do you think about this new robotic vacuum cleaner? Would you buy one? Have one already? Share your experience with us.